AVENGERS: INFINITY WAR has finally hit theaters. It’s taking all my strength not to go on and on about how awesome this movie is. If you haven’t seen it yet, I’m sure you will soon. Of course, I’ll not be spoiling the film for anyone. After all, Thanos demands your silence. However, whether you’ve seen the film or not, you may be curious to find out more about those bad guys running around with Thanos. They’re called the Children of Thanos in AVENGERS: INFINITY WAR, but as you might expect, their comic book origins are a bit different. In the Marvel Universe, they’re known as the Black Order, or the Cull Obsidian (which translates to Midnight Slaughter). 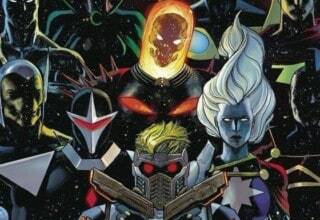 Created by writer Jonathan Hickman, the group consists of Corvus Glaive, Proxima Midnight, the Ebony Maw, Black Dwarf, and Supergiant (who isn’t in INFINITY WAR). 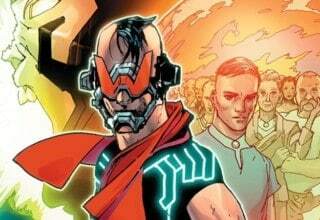 They first appeared in Hickman’s own INFINITY event (specifically, in INFINITY #1). After that event concluded, they remained prominent throughout the remainder of Hickman’s AVENGERS. Then, they sort of dropped out of the Marvel Universe for a while. Recently, though, the Black Order was reborn in the pages of AVENGERS: NO SURRENDER. But, who exactly are the Black Order? What significance do they have in the Marvel Universe? What are each of the members capable of? 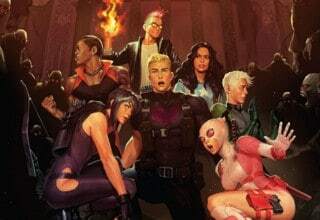 Are they as cool in the comics as they are on the big screen? Why exactly did they change Black Dwarf’s name to Cull Obsidian in the film? Let’s take a closer look at this cadre of villains and see what they’re all about. For simplicity’s sake, I’ll be examining the members of the Black Order in alphabetical order. Let’s get to it! Black Dwarf is, simply put, a brute. That’s not to say he’s a dim-witted buffoon, but he’s certainly not the brains of the group. He’s the muscle, first and foremost. He stands at just about the same height as Thanos, maybe a bit taller. Given his size, he’s appropriately super strong and super dense; his skin is unbreakable, much like Luke Cage, except he’s got a sort of scaly look to him and is obviously much bulkier. Wielding either a giant club or axe in combat, he’s an absolute menace on the battlefield. As with all of the Black Order members, not much is known of Black Dwarf’s exact origin. His brief bio from NEW AVENGERS #9 (2013) reads, “Feigning joy and contentment, in reality this celestial nihilist is simply more at peace with the oblivion Thanos seeks than the rest of the Black Order.” It also references him as the most normal member of the group, which says a lot, considering the colorful cast of the Black Order. Black Dwarf is featured most prominently during INFINITY. In NEW AVENGERS #9, he leads an army against Wakanda, but Black Panther defeats him. In AVENGERS #23, he returns to face off against a handful of Avengers, including Black Widow and Shang-Chi. Shortly after, he takes on Gladiator, Kl’rt the Super-Skrull, Ronan the Accuser, and Annihilus. Ronan kills Black Dwarf by brutally bashing his skull in. 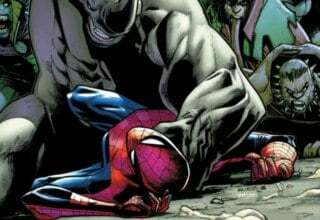 Black Dwarf wouldn’t appear again until recently, in the pages of AVENGERS: NO SURRENDER. AVENGERS: INFINITY WAR changed Black Dwarf’s name to Cull Obsidian. As I mentioned before, in the comics, Cull Obsidian is the secondary name for the Black Order. Well, from what I understand, it was to avoid confusion. In the case of both Black Dwarf himself, and the Black Order as a whole, it was probably easier to rename them, so people wouldn’t mistake them for Black Widow or Black Panther. I mean, I can’t imagine it’s that hard to remember names like this, but Cull Obsidian still sounds cool, and it fits the character. So, no harm, no foul. Probably the most interesting and frightening member, Corvus Glaive is sort of the de facto leader of the Black Order. Of course, Thanos commands them, but Corvus is basically the overall field commander when Thanos isn’t around. INFINITY #1 introduces him as the first member of the Black Order. He’s a wiry figure who dresses in dark robes and wields his trademark glaive. His bio from NEW AVENGERS #9 marks him as Thanos’ most favored member of the Black Order. He’s got your average strength and speed enhancements, but Corvus’ most interesting power comes from his blade (which can cut atoms). As long as the blade remains whole, Corvus cannot die. Corvus is also the husband of fellow Black Order member, Proxima Midnight. The definitive Corvus Glaive issue is INFINITY #1; his introduction is incredible. I could read it over and over again for as long as you’d let me. He arrives on an alien world to collect a tribute for Thanos, presenting the King and Queen of that world with the broken sword of their murdered son. The way Corvus monologues and speaks here demands your attention. He’s conniving and vicious, and it’s easy to see why Thanos thinks so highly of him. 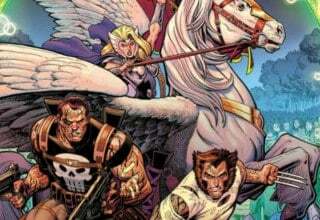 After this introduction, Corvus continues to appear in Hickman’s AVENGERS and NEW AVENGERS. Recently, in the THANOS solo series, Thanos broke Corvus’ blade and forced him to kill himself. But, like his fellow Black Order members, the Challenger saw to his resurrection in AVENGERS: NO SURRENDER. “A thin razor of a man. Not a fighter, a thinker. A black tongue that spreads mischief and lies wherever he goes.” Those are the first few lines of Ebony Maw’s bio from NEW AVENGERS #9, and they perfectly describe his character. He is a calculating and sadistic being, and he doesn’t even really have powers. Well, he does. He’s weird, to say the least. The Ebony Maw is a genius, first and foremost. There’s very little you can get by him without him knowing about it. He is extremely manipulative; he plants a mind web (a creepy spider-looking thing) in Doctor Strange with relative ease. The Ebony Maw’s tactics are unbelievably accurate. He regularly carries a very uneasy aura. When he’s on the page, you know something drastic and clever is about to happen. As part of INFINITY, Ebony Maw absolutely shines in NEW AVENGERS #9 and INFINITY #6. In NEW AVENGERS #9, we see Maw break into the Sanctum Sanctorum and whisper delicate lies to the Sorcerer Supreme. There’s a particularly creepy image where it looks like Maw is going to bite into Strange’s neck like a vampire. 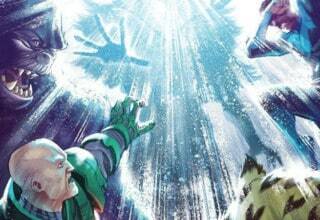 In INFINITY #6, Maw coaxes Thanos’ son, Thane, to trap his father in an ember cube, along with Proxima Midnight and the ashes of Corvus Glaive. Later on, Maw becomes a sort of mentor to Thane, appearing in the pages of writer Jeff Lemire’s THANOS. Most recently, Ebony Maw appears during AVENGERS: NO SURRENDER. Proxima Midnight is labeled as “The cruelest of Thanos’ generals.” She is one of the finest warriors you’ll ever find in the Marvel Universe, the best in Thanos’ army. Her odd headpiece withstanding, Proxima Midnight is nothing short of intimidating. She is agile, tactful, and as sharply witted as her spear. Speaking of which, if her impressive hand-to-hand combat skills aren’t enough to impress you, then her spear should do the trick. When thrown, her spear breaks into three beams of light that never miss. That’s on top of her good aim. She’s kinda like Hawkeye and Bullseye, except there’s less work involved. Proxima Midnight is the wife of Corvus Glaive. She briefly appears in THE UNWORTHY THOR, where she tries to steal the hammer of the Ultimate Thor for Thanos. Like her fellow Black Order members, she is most recently seen in AVENGERS: NO SURRENDER. Not much is known about Supergiant. Which, I suppose for you moviegoers is a good thing, because she doesn’t show up in AVENGERS: INFINITY WAR. This isn’t as big a deal as you might think. Other than Black Dwarf, she is the least fleshed out member of the Black Order. They probably kept Black Dwarf because he’s easier to apply in big combat situations. However, that’s not to say Supergiant isn’t an interesting character. Quite the opposite, in fact. Supergiant is described as “a mentally unstable omnipath and telepathic parasite.” Unstable is putting it lightly, given what we see of her during INFINITY. She feeds on knowledge stolen from others. She’s definitely a dangerous adversary. During NEW AVENGERS #9, she’s able to basically possess Iceman during the Black Order’s attack on the Jean Grey School. Later on, in INFINITY #6, we get a bit more of her backstory. Without trying to make light of the subject matter, Supergiant was suicidal from a very young age. Thanos found her in an orphanage and she begged the Mad Titan to kill her. He would grant her wish only after she helped him kill all his other children. In the end, she gets her wish, but not exactly in the style she wanted. As she’s about to set off a bomb to eradicate Earth, Lockjaw teleports her away to a deserted planet. The bomb detonates, destroying the planet, and Supergiant along with it. She wouldn’t appear again until AVENGERS: NO SURRENDER. So, there you have it. That just about covers everything you need to know about the Black Order going into AVENGERS: INFINITY WAR. They’re a group of badass aliens who are undyingly loyal to the Mad Titan. They’ve each got unique skills and come together to form a fearsome team. What more could you ask for in a group of baddies? Having seen AVENGERS: INFINITY WAR, I can definitely say that the film handles them differently. I won’t get specific, but their powers and abilities have been tweaked a bit. This was likely done to simplify them for the film’s sake, which is smart. Regardless, it doesn’t detract from how cool they are in the movie. Although, it does kinda stink that none of them, other than the Ebony Maw, even get a name drop. Sadly, the Children of Thanos are basically nameless characters on the big screen. That is, unless you know their names going in. Nevertheless, now that you know a thing or two about the Black Order, you can be the one your friends come to with questions about these new characters from AVENGERS: INFINITY WAR. Speaking of which, stop wasting time and go see it! And if you have seen it, check out our review of the film here! Previous article Does Anyone Else Think STEINS;GATE is Overrated?